Do you want grandpa to see your latest Tweet? Does grandma want to see photos of your latest family vacation that’s in a Facebook album? 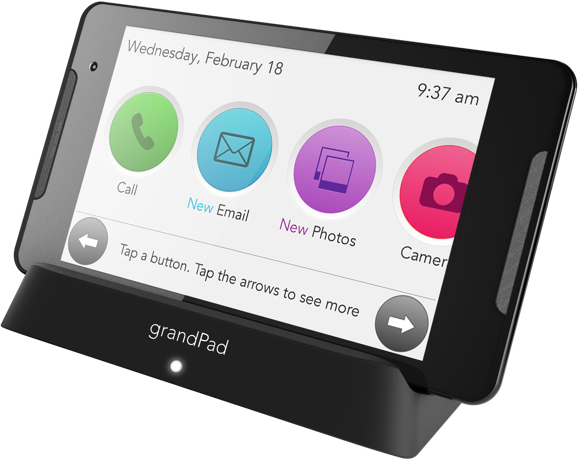 Help grandparents become more tech-savvy with GrandPad, the Senior Tablet! GrandPad is a simple and secure tablet computer that digitally connects a senior to their family and friends. Seniors can easily view family photos and videos, play games, see the weather for each family member, listen to music, check emails, make phone calls, place a video chat, and much more. For just $200 the GrandPad can be your grandparents’! With GrandPad, you get more than a product – it’s also a service! The month-to-month GrandPad membership is all-encompassing, worry-free with no contract required. Every GrandPad membership includes easy access to our outstanding customer service specialists. Included & Built-in wireless data connectivity means seniors are constantly connected to high-speed internet. Theses memberships range from $10-$40 depending on the type of service wanted. GrandPad helps users to stay in touch with friends and family.